Congratulations to Trudy Jewell, you are the winner of last week’s book giveaway Forever Paws by Christine Davis. Look for an email from Layla. My garden turned out to be the perfect setting to photograph our giveaway. For all my book reviews, here and at The Boomer Muse I like to show off both the front and back covers. In this case it really makes a difference. Mother’s Day is coming and we wanted to have book giveaway that would make an ideal gift for any cat loving mom. We’re delighted to offer our readers the opportunity to win a copy of The French Cat by renowned photographer Rachael Hale (Ms. Hale is now known by her married name McKenna). Originally from New Zealand, she moved to the South of France with her husband and young daughter in 2009 to make her Francophile dreams a reality. 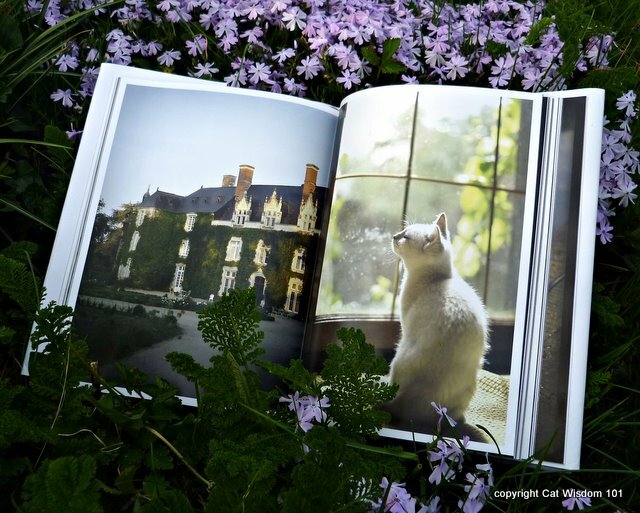 This book is a photo journal of her new life in France with historic buildings, fairytale settings and cats, both stray and pampered of every stripe gracing the pages. The dreamy, evocative images will transport the reader to a magical world. You’ll be tempted to take a razor to many of the images and frame them. They are that beautiful. I confess to having the same French dreams, and until I live La vie Francaise, I can live vicariously by this swoon-worthy coffee table book. The author has a blog, where you can see more stunning images and learn about her latest book The French Dog. 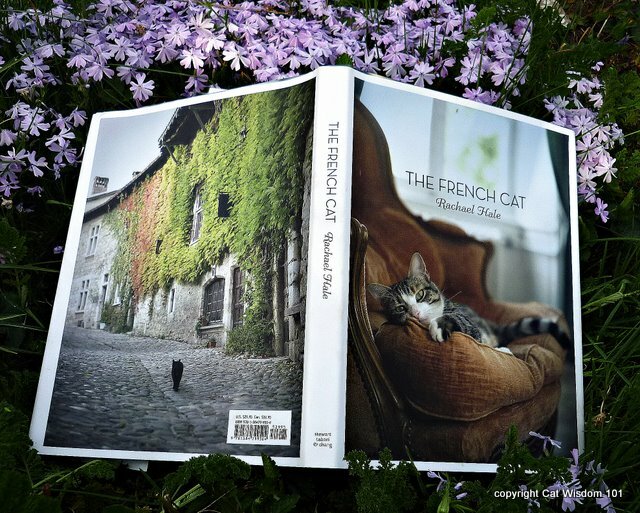 You can win a copy of The French Cat for yourself or to give as a gift by simply leaving a comment at this post anytime until 11:59 pm ET, Saturday, April 28, 2012. For extra chances to win, social media share. Have you liked our Cat Wisdom 101 Facebook Page This is where we post bonus fun quotes and photos. I would love to win it sounds like a great book. Oui, The French Cat book is The Purr-fect Mother’s Day Book Giveaway. We bought a copy and love it everything about it. Thanks for sharing! Oh this is right up our Mom’s alley. You know she fancies herself as a photographer. We think she is just a woman with a camera. But combine cats and cameras and she is all in. WE also tweeted! As a librarian our cat loving patrons would love it – after I read it, of course. And YOUR photos OF the book are gorgeous too! This book looks so good. The pictures look stunning. Any cat lover would like this. Ahhh oui oui, mon cherie! Two of my favorite subjects, France and cats, looks lovely. Oh! What a gorgeous book. Happy Earth Day to you too! What a handsome book! Happy Earth Day to you! I love Tinch’s comment. The photos here prove that American cats are just as pretty as the French or vice versa! That just proves that cats are beautiful in any language! Happy Earth Day to you too. What a beautiful book. Looks like it has some great photography. Have a super day. Happy Earth Day!! Oh this book looks so gorgeous and utterly lovely!! 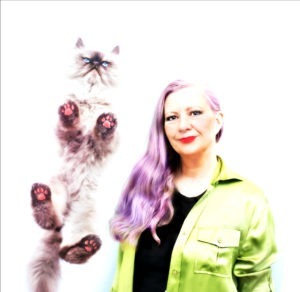 Good luck to all entering the giveaway – it’s purrfect! Congrats to Trudy! Who among us has not had the fairy tale dream of France….siggggggggggggghhhhhhhhhhhhhhhhhh. Mon Dieu, mon dieu, mon dieu La Chatte Francaise! Je pense que je vais aller dans le sud de la France !!! Am in Montreal 6th to 13th of May. I just realized that I’m coming back on Mother’s Day. That way, my family doesn’t have to spend money we don’t have on taking me out. We can do ‘eat in’ when I get back. This is a lovely book!